This knife will take abuse like no other! Cheapest of the Cold Steel tanto line, it is everything it's big brothers are and more with the tactical finish. This is the knife of the persev (don't know what a persev is? Rent the movie Exposure with Peter Coyote-you'll never think about your knife the same way again...). Penetrates 55 gallon drums and slices hanging 3/4 inch manila rope repeatedly. Carry this one if you're going into combat; it won't let you down. 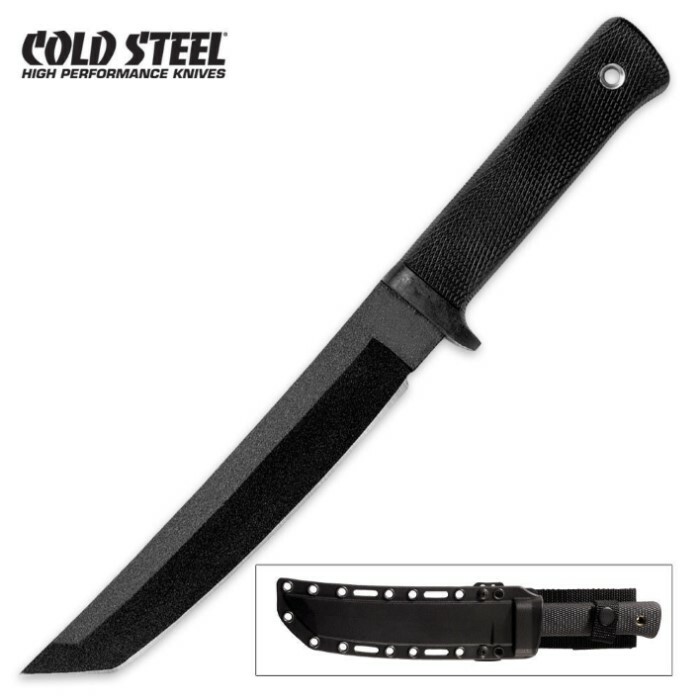 Cold Steel makes the best knives, swords, etc. out there. This knife is no exception. It puts other knife companies to shame in virtually every aspect. This is definetely the best blade I have ever bought. Lightweight but definetely heavy enough to do some damage. The blades very durable and can handle almost anything you can throw at it. from the picture it looks like the handle would be uncomfortable but looks can be decieving. The handle is actually very comfortable. The blade comes razor sharp. The tanto is bigger than I thought which is good. Overall if I could give this ten stars I would. If you have the money and are debating whether or not to get this then get it. you wont be dissapointed! I own over 100 knifes, and this is by far my favorite. But I'm glad i went with this one. The design and durability are amazing.